What do Chimney Coulee, the great Sandhills, Palliser Triangle, Cypress Hills, Willow Creek, Fort Walsh, ’76 Ranch have in common? They are evolutionary geographical features of the Swift Current Gen Web Region. It is with an understanding of this region that researchers will garner an interest into its character, values, institutions, and the way the culture has characterized its peoples. What is the heritage of the Swift Current Gen Web Region? History has many tangents, and no single facet can tell the complete story, as the roots come from a wide variety of cultures and experiences. 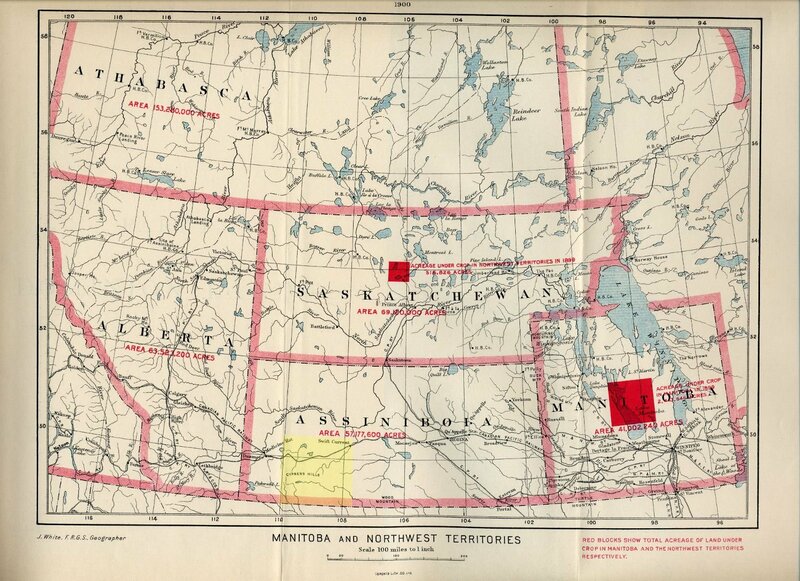 The Captain John Palliser British North American Exploring Expedition of 1857-1860 defined a triangular area radiating south from Kindersley as basically an extension of the Great North American desert, and encompass the Great Sand Hills of Saskatchewan. Palliser’s expedition arrived during a cyclical episode of great drought. The first nations of the plains have had a rich history in this area. The Snake and Gros Ventres of the 17th century were gradually displaced by the Assiniboine in the 18th century. The Sioux came up from the United States over the latter half of the 19th century creating settlements. The small pox epidemic of 1832, which lasted six years, virtually wiped out 31% of the Assiniboine population killing over 4,000 persons. All the British colonies of Canada, provinces and territories were united in the Canadian Confederation on July 1, 1867. To include British Columbia into confederation, an inter-colony railroad would improve communication and transportation in general between the settlements of eastern Canada, those communities of British Columbia. To make the railroad economically viable, pressures arose to expand the population across the prairies to improve trade. Rupert’s Land, or Prince Rupert’s Land, was a territory in British North America comprising the Hudson Bay drainage basin. This land was operated by the Hudson’s Bay Company for 200 years from 1670 to 1870. Rupert’s Land was transferred to Canada in 1869, but the transfer was only consummated in 1870 when £300,000 was paid to the Hudson’s Bay Company. Le Mont-aux-Cypres / Cypress Hills Metis settlement established a presence in this area 1870. It was also during this decade, that “consumption” or pulmonary tuberculosis ravaged the population of the indigenous population. Back in 1871, Isaac Cowie operated a Hudson’s Bay Company post from 1871-1872 trading with the area Metis. This site came to be known as Chimney Coulee [now a Provincial Historic Site]. Isaac Cowie stayed only the one winter, taking back with him thousands and thousands of pelts, never to return. In Saskatchewan, the majority of trading posts were operated near or north of the “tree line” or where settlements Metis or immigrant were established. The Government of Canada passed the Dominion Lands Act of 1872 creating the opportunity for settlers in the Last Best West. The creation of the Department of the Interior in 1873 had a mission to attract settlers to Canada, creating a strong agricultural economy out west. Settlers were pulled to the area with strong motivations of a better life, and were pushed out of their homelands because of restrictions, over-populations, and under-employment. The British North American Boundary Commission surveyed the international boundary along the 49th parallel between Canada and the United States of America between 1873-1874. Dr. George Mercer Dawson was the geologist-naturalist who reported “prime grazing land” in his investigations along the border survey. In 1874, thirteen First Nations chiefs signed Treaty Four at Fort Qu’Appelle which covered the land south of the South Saskatchewan River. Cree, Saulteaux, Nakota are among the contemporary thirty five First Nations encompassed by Treaty Four. Whatever the cause of prejudice and animosity between the First Nations and the traders, the Cypress Hills Massacre set a precedent for the Dominion Government. Fort Walsh North West Mounted Police Post [now a National Historic Site of Canada a was erected 1875 in Cypress Hills. Additionally NWMP posts were created at Maple Creek, Willow Creek, Ten Mile, Farwell, Eastend, Stone Pile, Snake Creek, and Swift Current in the Swift Current Gen Web Region. The police regularly patrolled the trails discouraging whisky trading, cattle rustling, overseeing the railway camps, and generally maintaining “law and order”. David Laird becomes the first Lieutenant Governor of the North West Territories in 1875. John Macoun, a professor of natural history examined the areas of the South Saskatchewan Rivers in 1879-1880. The weather on the prairies cycles between drought, and extremely wet spring and summers. Macoun’s wet summer was in direct contrast to the drought experienced by Palliser. Macoun sent news to the Government surveyors, that the lands between Moose Mountain, and Cypress Hills featured great swaths of green grasses, forecast productive soil for cultivation. The Buffalo which had previously roamed the plains in great herds were decimated by 1879. The buffalo were gone, the main source of sustenance for the First Nation’s People. The Canadian Government facilitated large scale farming and ranching prior to the homestead settlement of the “Last Best West.” The Dominion Governments policy regarding ranching, and grazing land evolved considerably between 1870-1930. Basically any lands unfit for crop production, and could not be used for homestead settlement, would be recommended for grazing lands. Grazing leases were established for up to 12,000 acres of land. Cattle are the major ranch animals, supplying beef on demand. Ranches generally speaking were a large scale affairs, because low productivity is involved. They require large areas of land with low population density. Edgar Dewdney is appointed by Prime Minister MacDonald as the new Indian Commissioner, and arrives at Fort Walsh 1879. In 1880 over 5,000 Indians come to Fort Walsh on treaty day seeking assistance as they are starving. Dewdney forced all the First Nations to leave Fort Walsh in October of 1882, starving as they were, and travel back to their reserves for their annuities. MacDonald himself traveled to Fort Walsh in November 1882 to make treaty payments. Maureen Katherine Lux quotes MacDonald; “I know they are not getting enough flour but I like to punish them a little. I will have to increase their rations, but not much.” With such treatment, those First Nations who had held out, and not signed treaties were forced to submit, as their people were so hungry and weak. Throughout this decade, First Nations people died from Whooping Cough, tuberculosis, and starvation. Though the country of Canada first envisioned a northern route for the transcontinental railway through Prince Albert, the agricultural promises provided by Professor Macoun coupled with the threat of an American invasion, changed the laying of the rail. The 1881 contract given the Canadian Pacific Railway Company saw the rail extend from the province of Manitoba and reach Swift Current by 1882. This railway, the Canadian Pacific Railway created the first transcontinental railway, and served as an impetus to bring settlement and development across the plains. 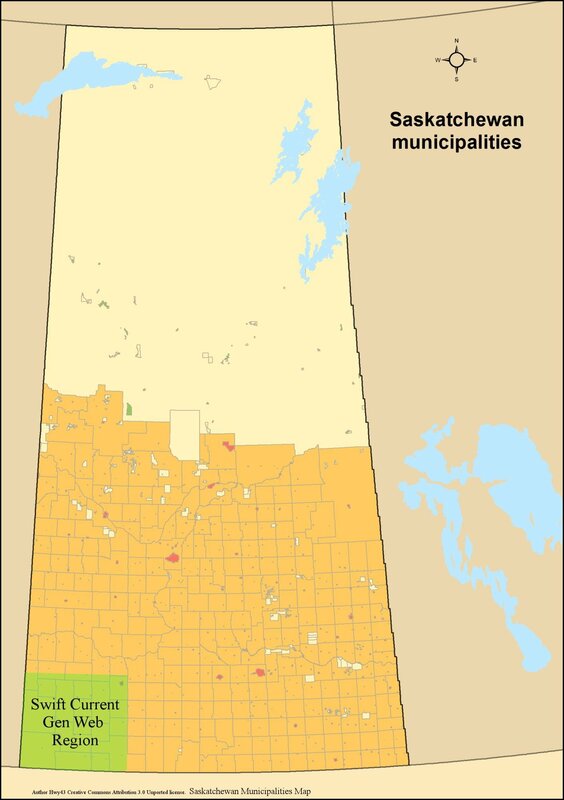 The District of Assiniboia, North West Territories, was created in 1882 as a regional administrative district of Canada’s North-West Territories. The province of Saskatchewan was created in September of 1905. Rangeland, Cattle Companies and Ranches. A Scotchman by the name Sir Lister Kay arrived in the 1870s, one of the first ranchers who to the area, ranching between Swift Current and Medicine Hat NWT, a rangeland of about 150 miles. Kay had about 30,000 sheep and several thousand cattle. The “76” Ranch at Crane Lake owned by the Lister Kaye Co. and under the management of a great cattleman, D.H. Andrews, was one of the most profitable and successful ranches according to notes of the Saskatchewan Historical Society. The “76” Ranch at Crane Lake was then operated by the Canadian Land and Ranch Co. with their headquarters at Crane Lake which Kay had left behind. No discussion of the Saskatchewan Range would be complete without mentioning the Empire Cattle Company, and T Bar Down and the Conrad Price major ranches. To recall the “Round Ups” of the early twentieth century, Mr Harry Otterson, range manager of the Bloom Cattle Company recalls a round-up of 1904. “The range business has passed through some marked changes in the Cypress Hills the past thirty-five years. The vast territory lying between the C.P.R. railway and the Milk River in Montana was an empire of grass and water, where cattle roamed at will. The round-up outfits reached far from the home ranch during the summer to gather the straying cattle and return them to their range. …The trailing of sheep in great numbers, between the Milk River, and the Canadian line was fast destroying the range for cattle, and Montana cattle were moving into Canada in increasing numbers, partly on account of the splendid range found there, but largely on account of the vast trek of shepherds across their home range. During the late summer of 1904 there were several disastrous prairie fires along the Canadian border and the greater part of the range was burned, from Battle Creek east to the Frenchman River, north of Saco, Montana. “~Maple Creek News 1939 The Bloom Cattle Co. located at T Bar Down Ranch Herds of the Bloom Cattle co ranged in size from 3,700 head of cattle to fifteen thousand steers. ~ The Eastend Enterprise March 24, 1938 The Turkey Track Ranch was located to the east, and the “76” range to the north. The Oxarat Horse Ranch near Fort Walsh was the oldest and largest horse ranch of the country in the early 1880s. Ranching was not without perils and the miles of grassland gutted by enormous raging grass fires has already been mentioned in 1904 resulting in scarcity for the cattle feed. Another peril came for the Turkey Track Ranch under Messrs. Cresswell and Day which set up during the summer of 1903, and they were hit by the worst winter on record for cattle. Deep snow falls alternated with frost, seizing up the cattle, resulting in a loss of over 8,000 head of cattle. Generally speaking cattle could fend for themselves over the winter months, however the winter of 1906-1907 also took thousands of cattle caught up in the great northwest blizzards. The Canadian Pacific Railway fenced off their rail grade, and cattle, pressed forward by the northwesterly winds were caught on the CPR fence wires, and perished. The larger ranch outfits who had a rider traveling with the herds could cut the CPR fence, and let the cattle through to open wind swept lands, and coulees for protection from the fierce wind, fared better during this severe winter. Those cattle outfits which were smaller and without a rider lost as many as 90% of their herds. Miriam Green Ellis recalls that, “apart from the fur trade, ranching is the oldest business in Western Canada. The ranchers came on the heels of the buffalo, and established themselves in pretty much the same locale, which was natural. They figured that if the grass could feed buffalo the year round, it should be able to feed cattle, sheep and horses. The grass in this area cures on the ground and in the old days the stock never got anything else, nor had they any winter shelter except the coulees. ” It was in 1912 that the “lease system” required that the rancher had to reside on the land of his lease, and the open range for cattle grazing became a thing of the past. In the declining years of the Saskatchewan rangelands, Robert Cruikshank kept the Rush Lake Ranch going, Gordon Ironside and Fares operated the Crane Lake Ranches, Gilchrist Brothers owned the largest cattle herd of South Western Saskatchewan by 1938. The June 13, 1944 edition of the Leader Post noted that cattle numbers were reaching the capacity of the rangeland. About 100 stockmen and ranchers owned around 90,000 head of cattle, and sheep. Swift Current Gen Web Region [green] in the Province of Saskatchewan Adapted from Author Hwy43 Creative Commons Attribution 3.0 Unported license. Lac Pelletier in 1907, Dollard and Val Marie in 1910 were a few of the French settlements in the region. Shaunavon received Irish settlers, and Webb the Welsh. Belgian settlers were attracted to Swift Current as were the Dutch immigrants. A large Norwegian Ethnic Bloc Settlement arose around Climax and Robsart in 1911 along the USA and Canada border, and extended north for some 12 to 24 miles and extended east and west 60 miles. Swedish settlers arrived to Admiral and Shaunavon, often working at the Canadian Pacific Railway to earn cash in order to prove up their homesteads. A German group settlement arrived to the area round the Vermillion Hills, Herbert, Excelsior, Swift Current and Coulee. In the 1920s Russian and American German concentrations of immigrants were found in southwestern Saskatchewan around Eastend, and Consul areas. Hutterites migrated from the U.S.A. to Alberta and Manitoba around 1918. The migration from Alberta to Saskatchewan bean in 1952 when lasws in Alberta changed. A Canadian Mennonite Board of Colonization began in 1922 Refugees from Russia settled between 1923-1929. Emmaus General Conference Mennonite [GCM] saw 368 immigrants settle at Swift Current, Gull Lake, Wymark, Schoenfeld, McMahon, “Pella” at Neville, and “Rhineland” at Wymark. Herbert GCM 224 settlers settled at Herbert, Gouldtown, and “Glen Kerr” at Morse. Mennonite Brethren “Bethania” settled at Main Centre , “Elim”  at Kelstern, “Gnadenau”  at Flowing Well, Green Farm , Main Centre , Swift Current. The Herbert Invalid Home was established at Herbert. How have the settlers, and First Nations living in the south western corner of Saskatchewan defined themselves in contrast with populations overseas, and across North America? How has the geographical location of the area changed over the centuries? How useful is the concept of the history of the Swift Current Gen Web region when it comes to define the modern civilization, and our ancestors from this neck of the world? The study of human geography studies the climate, religion, culture and physiography as humans interact with their physical geography. This is a small study with a focus on the Swift Current Gen Web portion of the province of Saskatchewan, and its political boundary evolution, demographic changes, and climatic forces. The economic, political and cultural dimensions of the Swift Current Gen Web region have indeed evolved over time. Fung, Ka-iu. Atlas of Saskatchewan Celebrating the Millenium 2000-2005. University of Saskatchewan Second Edition. ISBN 0-88880-387-7. PrintWest Saskatoon. 1999. Evans, Simon. The Saskatchewan Range in 1906 and 1921. Pages 64-65. Norton, William. Human Geography Sixth Edition. Oxford University Press. ISBN 978-0-19-542511-6. 2007. Pohorecky, Zenon. Saskatchewan People A brief illustrated guide to their Ethnocultures. Second Enlarged Edition. 1977 Saskatoon. Saskatchewan Association on Human Rights, Canadian Department of the Secretary of State, and the Saskatchewan Department of Culture and Youth. Richards, J.H. and K.I. Fung. Group Settlements. Atlas of Saskatchewan. University of Saskatchewan. Modern Press. Saskatoon. Page 13. 1969.